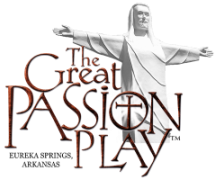 ﻿Cast and crew registration for the The Great Passion Play in Eureka Springs, Arkansas, is held on the 2nd Sunday of March annually on the grounds of The Great Passion Play. Those interested in being a member of the cast may apply between 2:00 PM and 3:30 PM. The 2019 season is April 19 through October 26 and runs around 80 performances (View season schedule here). Men, women, and children five years of age and older are needed for this year’s cast. There is a particular need for men between the ages of 18 and 45 to play the parts of apostles, priests, and soldiers as well as families with children. If you have ever wanted to be a cast member of a world-class theatrical production, let this be your year to apply. Those who have an interest in joining this wonderful cast and who are unable to come to the 2nd Sunday of March cast registration are invited to call the Play before that date at 479-253-8559 between 9:30 AM and 5:00 PM to be considered. In conjunction with cast registration, applications will be received and interviews conducted for the following positions: ushers, parking attendants, Holy Land Tour actors, gift shop workers, maintenance positions, bus drivers, docents (museum guides), food service, and reservations clerks on the grounds of The Great Passion Play on Sunday, March 10 from 2:00 PM to 3:30 PM. Two new attractions on the grounds this year include a marketplace area and petting zoo area with opportunities for craftspeople and a talented face painter! You can download the documents below, or we will have them available on the sign-up day. Call 800-882-7529 if you would like to volunteer, or click here to learn more! Two new attractions on the grounds this year include a marketplace area and petting zoo area with opportunities for guest craftspeople and a talented face painter! Submit your resume and pictures of your work below.